The Petroleum Corporation of Jamaica (PCJ) has awarded over $2 million in cash and prizes to 30 students who emerged as winners in its 2016 Schools Energy Programme Competition. The competition, which is comprised of an essay, science and poster challenge, is the culmination of the School Energy Programme which the PCJ executes each academic year. 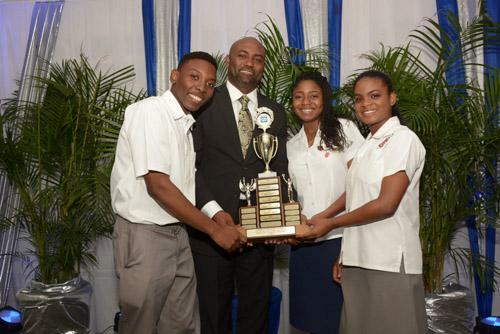 The flagship initiative involved more than 1000 students from 75 Primary and Secondary Schools across the island. Participants learned about a wide array of social and economic energy issues as well as methods of energy production and the importance of efficiency and conservation. Exposure to these critical issues came through the Programme’s energy seminar series as well as guided tours of local energy facilities including the JPS’s hydro plant and wind farm which are both in St. Elizabeth as well as the Wigton Windfarm in Manchester. “The PCJ has the task of educating the public about energy issues and our students are a particularly important target group,” said Group General Manager, Winston Watson. “Through our Schools’ Energy Programme we expose young persons to energy matters in a fun and interesting way which we hope will encourage them to become advocates for energy conservation at home and school,” he added. The poster competition challenged students to illustrate various energy concepts; while participants in the essay competition were asked to discuss some of the challenges encountered with the generation and use of renewable energy. The science competition was a group effort which required students to design and build a model solar energy system that could provide energy for their school. 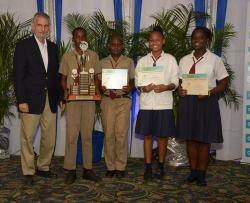 The top three entrants in each category of the competition received $50,000, $40,000 or $30,000 respectively. Most of the cash prizes were underwritten through sponsorship support from several public and private sector entities including JMMB, JPS Foundation, Pear Tree Press, Petrojam, Jamaica Energy Partners, PowerGen Limited, Petrojam Ethanol, Digicel Jamaica, Development Bank of Jamaica, Half Moon Resort, PetroCaribe Development Fund, Wigton Windfarm Limited, Restaurant Associates Limited and Mayberry Investments Limited.